Greetings everyone, and welcome to the June bulletin and to our “dual” sign of Gemini. This time last year there was no June bulletin because I had put my back out and was in so much pain, I couldn’t even sit at the computer or write! So without wasting any time or words, I’ll get right to it – this month’s theme is Communication. Remember that our first sign of Aries gave us Life, Taurus uncovered our Senses, and now Gemini exposes us to the Mind and Intellectual Thought. Simply put, Gemini is the sign that “thinks” (constantly!). Remember that our first two signs were represented by members of the animal kingdom (the ram and the bull) but now we are introduced to our first human being, or should I say “human beings?” You’ll see in the illustration we have the two twins, the symbol for Gemini. Notice that one of them is holding a lyre – why’s that, you may ask? Because the planet Mercury rules Gemini and it was Mercury (or Hermes for the Greeks) who invented the original “lyre.” In the olden days, before we had computers, telephones or the Internet, messages and stories were passed down through song and story-telling. And, if you think about it, simply look at the word “History” and we can see how it can broken down to read “his story.” So it was “his story” than gave all of us our “history.” And just as Gemini is the sign that records our history, our sign for next month will be Cancer, and is the sign that loves to go back into the past and learn about all of that history! But back to Mercury, whose job description would have read as “Messenger of the Gods,” giving us a reference to Communicationright away. 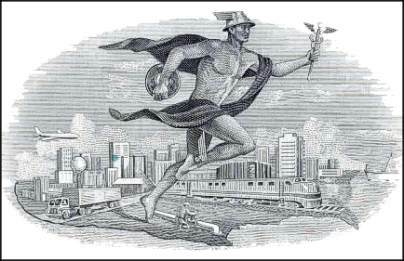 It was Mercury who literally delivered all of the Gods’ celestial messages, packages and telegrams as he traveled swiftly between all three worlds (the sky, the earth and the underworld) with his “winged” helmet and feet. And it is from Mercury that we also get the word “merchant” introducing us not only to Travel, but to Trade as well. So it’s no accident for instance, that we have an International company today called Hermès known for their signature bags and luggage! 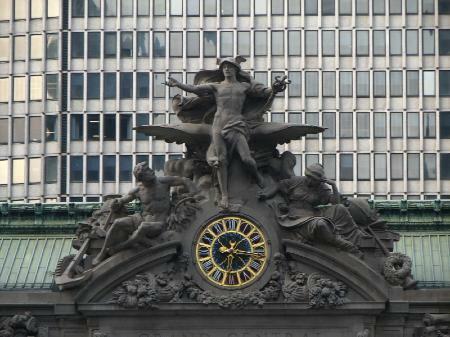 There is a statue of Mercury right there above Grand Central Station in New York City as well, and although the modern building behind it now says “Met Life,” in the good old days it was in fact “The Pan Am Building” which was far more appropriate! And while we’re on the subject of travel, as I am writing this month’s article, it is exactly 30 years ago this weekend that I moved to America. It is hard to believe that I have been here for that long! Thirty years? Now, even more interesting perhaps, is that this very same week, my assistant Chelsea (who works on the bulletins with me) will be celebrating her 30th birthday! As I was entering this country, she was entering this world! How crazy is that? So she was literally born the same week that I arrived here in New York and of course she is a Gemini. And not only would I like to wish her a very happy “milestone” birthday, but to also thank her for all of her hard work that she has done for me these past five years. Now, speaking of milestones, you may recall I showed you an illustrated history of the Queen’s hats back in April’s bulletin, so I would be remiss not to mention the official Diamond Jubilee celebrations over there in England, with numerous events taking place this month all around the country, from concerts to “block” (or street) parties, and more. But the main event in London on Sunday, June 3rd was certainly the Diamond Jubilee Thames River Pageant, with a 1,000-boat flotilla from all walks of maritime life, mimicking a Canaletto painting. It all started out pretty well, until the weather did its thing and it started to pour with rain! But did that stop them? Not bloody likely! You can’t expect the rain to stop the British, especially when it’s the Diamond Jubilee. Sadly though, the big “special” moment, the grand finale, and the one everyone was waiting for, had to be canceled at the last minute due to the inclement weather and poor visibility – so no big fly-by with planes in a diamond-shaped formation, but they did blow a few fireworks off Tower Bridge. Perhaps one of the classic moments was on the barge containing the Royal Philharmonic Orchestra, who among other patriotic favorites were playing “Land of Hope and Glory” and while the musicians were all safely down below under cover, the singers were braving the elements on the uncovered top deck, looking like a bunch of bedraggled drowned rats, but they still belted out their celebratory song to all and sundry, and especially to Her Majesty! My mum would have loved it. In fact, England’s got a busy summer up ahead of them, starting with the Queen’s Diamond Jubilee, followed by Wimbledon, and then they’re hosting the Olympics – pretty ambitious! I received this card recently from my aunt who lives on the Channel Islands, and I wanted to share it with you because it is so perfect for this month. 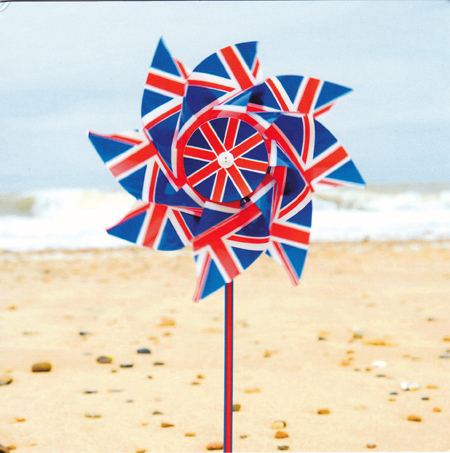 Not only is it celebrating the Queen’s Diamond Jubilee with the Union Jack flag motif on the pinwheel/windmill, but Gemini is also an Air sign remember, and two years ago I talked a lot about that and their natural love of flying! And a windmill needs the air to turn it, does it not? While we’re on the subject of boats – we just celebrated Fleet Week here in New York, so the river and harbor have been full of all sorts of maritime vessels and the city full of cute sailors in their smart white uniforms! And, this week they are moving the Space Shuttle Enterprise from JFK to its new home, on board the Intrepid Sea, Air & Space Museum on the River Hudson. But, wait, there’s more. Last week I received an email from an old college friend of mine, who now lives in Denmark, letting me know that his son Sam would be sailing in to New York aboard one of a fleet of 68-feet ocean racing yachts which are part of an amazing Round the World Yacht Race – http://www.clipperroundtheworld.com/index.php – and perhaps I might email him with some suggestions of good places to eat? Sounds reasonable so far, right? Well, the one condition though, was since I played “Ariel” opposite my friend’s “Prospero” in our final year production of John Dryden’s “The Enchanted Isle” (basically a rip-off of Shakespeare’s play “The Tempest”), and because my friend was able to attach a few good father-to-son stories to some of his son’s round-the-world ports of call, he insisted that I sign my email as “Ariel” and not as Louisa – which I obediently did, because Ariel always did what Prospero told him to, well, almost always. And in my email I told young Sam of my departure from the Enchanted Isle some 30 years ago and how I came to the fair isle of Manhattan, where I have stayed ever since! 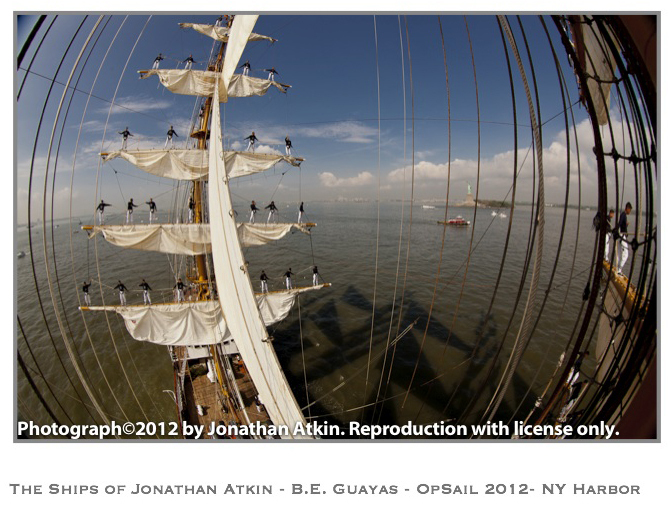 So this week, Ariel is hoping to meet Prospero’s young offspring and perhaps even take a tour of their clipper! In closing, I wanted to touch again on our theme of Communication. Communication doesn’t just denote our Trains, Boats & Planes and the concept of Travel – it also refers to how we deal and interact with one another. Without good communication, what do we have? We have potential misunderstanding, misinterpretation and mistakes. If we’re not coming from a place of love, how can there be right and proper communication? Part of communicating better with one another is not necessarily to talk more, but to also learn how to “listen.” We are all “wired” differently so good communication starts with our thinking, because what we say comes directly from our thoughts. And sometimes we don’t stop to think at all – we simply react and then potentially say something that we might regret later on. We’ve all done it. But hopefully, as we grow up and become mature adults (which can be hard for a Gemini), we work to find the best possible way to communicate with those closest to and around us. Our family, our friends and our co-workers. There’s an old saying that you attract more flies with honey than with vinegar, and it’s true. Saying a few nice words to someone could possibly make their day, make them feel appreciated or noticed, and in turn they might do or say something that makes your day better too. And Happy Birthday to all you Gemini’s out there!